The 2015 World Series of Poker (WSOP) is drawing to an end. However, there are other interesting events to come to the very poker enthusiasts delight. 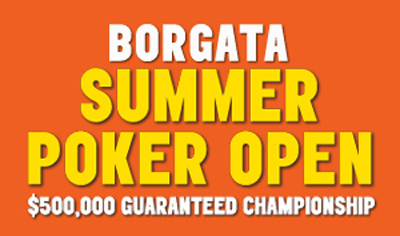 One of them is the Borgata Summer Poker Open to kick off on July 14, 2015. It actually promises to be an action-packed festival with 23 poker tournaments of different variants on offer, the likes of No-Limit Hold'em, Omaha and HORSE. These events are accessible from $ 230 to $ 2,500 of entry-fee. Speaking of its Main Event, it will run four day flights starting from July 26; the entry-fee is set to $ 2,500. Obvious as it is, Borgata Casino-Hotel & Spa in Atlantic City (USA) is playing host to the tournament. The 2015 edition of the Larry Flynt's Grand Slam of Poker is also among the not-to-be-missed poker tournaments this week. Hustler Casino in Gardena, California, has been chosen to be the premise where the festival will be played from July 14. It will last about two weeks and will feature eleven (11) No-Limit Hold'em tournaments accessible from $ 160 to $ 335 of buy-in. From July 15 to 19, The World Poker Tour (WPT) National will run another stop at Grand Casino in Brussels (Belgium). Its  750 buy-in Main Event will take place from July 16 to 19. In the meantime, the WPT will land at Choctaw Casino Resort in Durant (Oklahoma). With 25 events in the schedule, this series is expected to attract numbers of poker fans. The highlight event remains the $ 3,700 buy-in $ 2 million Guaranteed Main Event to be held from July 31 to August 4.